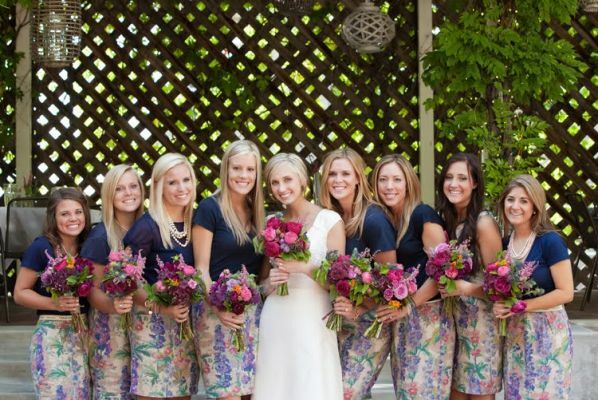 If you are a bridesmaid during the fall season, you are in store for some great selections for bridesmaid dresses. The hottest styles right now are two-tone, two-piece floor length styles, mostly sleeveless (strapless and spaghetti straps). Also very popular are column style dresses, floor length, halter top or straps criss-crossing over the back and sleeveless. Two-piece separates are also popular. Pastels (pale yellow, powder blue, lavender, soft pink, and pale green, peach), as well as sorbet/sherbet type colors such as tangerine, coral, sea green and lime are hot this year. Bright fluorescent colors, such as fuchsia and electric blue, are also popular choices. The hit of the town is brown with vibrant fall flower bouquets! Around Halloween, it is fun to bring in darker brown dresses with orange flowers to have an avant garde wedding. Bring in the fall colors of Thanksgiving including earth tones with accessories such as bracelets, necklaces and earrings, as long as they don't distract from the bride to be. Another popular and pretty trend, especially for spring and summer weddings, is a "color run". That means that each bridesmaid wears a different color of the same dress. Popular fabrics this year for bridesmaid dresses European satin, iridescent organza, silk, luminescent chiffon, iridescent taffeta. 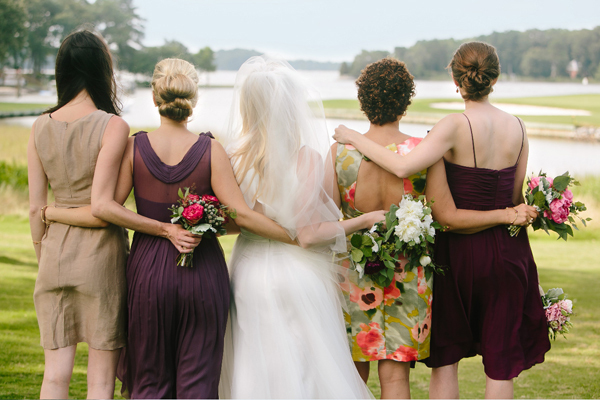 Make sure the bridesmaid dress material takes into consideration the Fall weather as it starts to cool down and possibly get a little windy in your area.